Challenge the luxury you know.™ The Kia K900 redefines your definition of luxury. Experience the luxury car fit for a king without the expensive price tag. 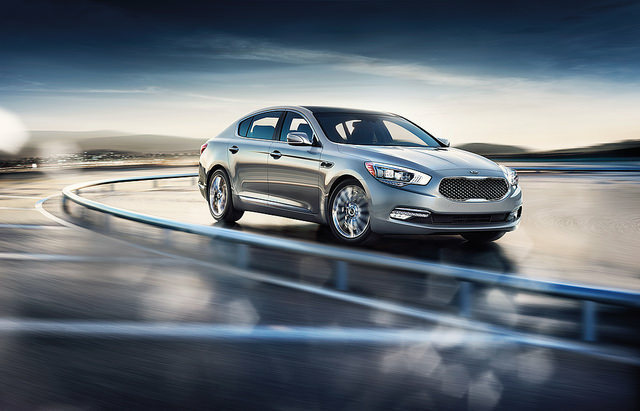 The 2015 Kia K900 is the perfect balance of elegant, sporty, and sophisticated. The K900 has a fierce, powerful, 5.0L V8 engine that generates 420 horsepower, wrapped up in one beautiful package. Rev that engine while enjoying total comfort and convenient tech features such as the 9.2-inch display, heated/ventilated front seats, and the premium audio system complete with 14 speakers. Stop into Carriage Kia to experience first-class in a 2015 Kia K900 today! 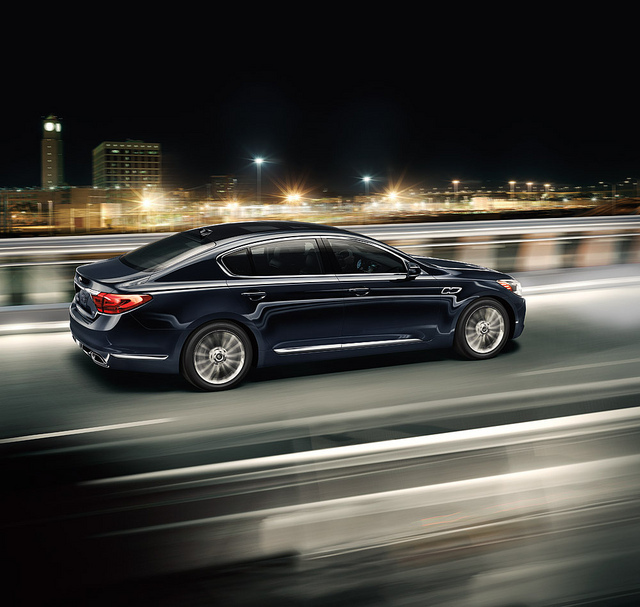 The 2015 Kia K900 is all power and performance. The K900 runs on an aggressive 5.0L DOHC 32-valve V8 engine generating an impressive 420 horsepower and 276 lb-ft of torque. The 2015 K900 can achieve up to 23 mpg highway and 15 mpg city*. Turn heads while changing the face of luxury in a 2015 Kia K900. The 2015 K900 has breathtaking standard exterior features including: Power-folding heated power mirrors with LED turn signal indicators, auto-dimming outside mirrors, panoramic tilt/sliding sunroof with power retractable sunshade, solar control glass, laminated windshield and side door windows, hydrophobic front door windows, heated rear glass with timer, auto light control, High Intensity Discharge (HID) headlights with Dynamic Bending Light (DBL), LED positioning lights, LED Daytime Running Lights (DRL), LED fog lights, LED rear combination lamps, LED perimeter approach lighting, automatic rain-sensing variable intermittent windshield wipers, windshield wiper de-icers, integrated dual exhaust with chrome surround, locking fuel filler door, shark-fin roof antenna, 19-inch painted finish alloy wheels. We warned you heads would turn. The 2015 Kia K900 has a sophisticated, extravagant interior space. Enjoy your drive in pure comfort and connectivity. The 2015 Kia K900 comes standard with convenient interior features including: Voice-command navigation with 9.2-inch display, Driver Information System (DIS) Multimedia Control, Park Assist, front and rear parking sensors with Park Guide System (PGS), cruise control, drive mode select, tilt/telescopic power steering wheel with audio, hands-free phone, and cruise control buttons, meter cluster with supervision Thin Film Transistor (TFT) LCD Driver Information Center Display, trip computer, push button start with Smart Key and immobilizer, rear ski pass-through door, auto-dimming rear-view mirror with HomeLink®, rear seat USB charging port, leather seat trim, 12-way power-adjustable driver’s seat, 8-way power-adjustable passenger’s seat, heated and ventilated driver and front passenger seats, integrated Memory System (driver’s seat, outside mirrors, power tilt/telescopic steering wheel), heated rear seats, leather-wrapped accents, aluminum upper front center console trim, stainless-steel illuminated door scuff plate trim, carpeted floor and trunk mats. Be entertained any way you’d like with one of the following standard entertainment features: AM/FM/CD/HD Sirius XM audio system with 14 speakers, UVO eServices, and SiriusXM Traffic, USB/auxiliary input jack, Bluetooth® Wireless Technology Hands-Free Connectivity with audio streaming. I think this car definitely has everything you are looking for in your next vehicle. While the exterior and interior of the Kia K900 might be impressive enough, the safety features are pretty outstanding as well. Some of the standard safety features on the 2015 Kia K900 include: dual front advanced airbags, dual front seat-mounted side airbags, full-length side curtain airbags, front active headrests, 3-point seat belts for all seating positions, front seat-belt pretensioners, 4-wheel disc brakes w/ Antilock Braking System (ABS), Advanced Vehicle Stability Movement (AVSM), Pre-Safe Belt (PSB), Electronic Stability Control (ESC), Traction Control System (TCS), Electronic Brake-force Distribution (EBD), Brake Assist System (BAS), Hill start Assist Control (HAC), High-Line Tire-Pressure Monitoring System (TPMS), side-impact door beams, front and rear crumple zones, Lower Anchors and Tethers for CHildren (LATCH), rear child-safety door locks, and an impact-sensing auto door unlock. Be sure to stop into Carriage Kia and experience luxury in a 2015 Kia K900 today! With our large inventory, our team here at Carriage Kia loves helping our customers find the perfect new car or used car for them! Please feel free to contact us if you have any questions or would like to schedule a test drive!